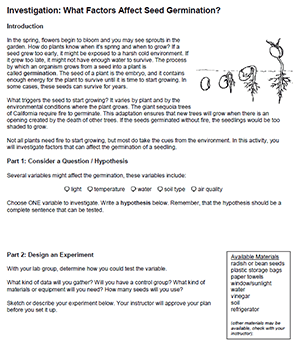 This activity can be used as part of a unit on plants or as an activity to illustrate the scientific method. The materials are cheap and can be obtained from the grocery store. Students design an experiment to determine what factors affect seed germination. They are given a list of variables that are appropriate for testing, variables such as water, air quality, temperature, and light. Though teachers could allow other variables to be tested, depending on materials they have in the classroom. Students must write a hypothesis and gather data by growing seeds, you can buy radish seeds, which germinate very quickly or buy lima beans at the grocery store. For the experiment to work, it is advisable that you give students the clue that water is absolutely necessary. Generally, you can get seeds to germinate by soaking them or placing them in a moist paper towel. Seeds can be kept in open plastic storage bags, beakers, cups or petri dishes. Water can still be tested as a variable, students can experiment on how much water is needed or even whether there is a difference between tap water or DI water. The experimental design section asks them to consider whether they will need a control group and what types of data they will need to gather. Students will collect data over a few days, mainly by making observations regarding how many seeds in have germinated. Students then write a lab report (or infographic) that describes their experiment and the results.